Surprisingly enough, one of the questions I hear most from people, along with “Why don’t you eat meat?” and “How can I eat healthier?” is “How do you make kale chips?” These green, crunchy snacks are causing a lot of people stress and disappointment in the kitchen, and also doing some damage on their wallet in the health food store, so I am going to give you the recipe that works for me. The flavor is light and crisp, and the chips will take on the flavor of the seasoning you use, so get creative! And get baking! 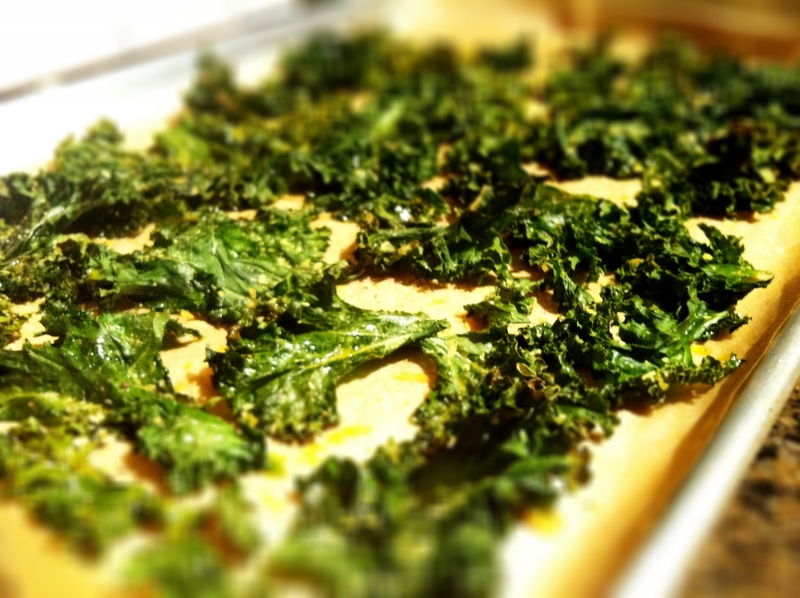 Kale Chips, fresh out of the oven. Rinse and dry kale leaves. Making sure they are dry is an important step, so using a lettuce spinner is ideal. Damp kale usually means less crunch. Remove the kale leaves from their inner stem and tear into bite size pieces. Place kale chips into a bowl, and drizzle in about 1 tablespoon of olive oil. *Trick: I like to coat my hands in olive oil and massage the kale chips, ensuring that everything is lightly coated and not drenched. Too much oil can cause the chips to be limp and greasy. Sprinkle in some salt and pepper, and whatever other seasonings you are using, and continue mixing. Place the kale chips in a single layer on a baking tray; using parchment paper is a great way to save a messy clean up and prevent the kale chips from sticking to the pan. Bake for 12-15 minutes, or until crisp. About 10 minutes in, you can toss them around so they bake more evenly. You can also add more seasoning after they have baked for a stronger flavor. Tags: chips, kale, kale chips, snack, snacking. Bookmark the permalink. Found this easy recipe and followed Amanda’s instructions to the T. Perfect and delicious! Thanks for sharing! I am so happy that you enjoyed them! My pleasure, Amanda! Thanks so much for the recipe. The details you included REALLY gave me the courage to try it, and I can’t wait to make them again!! !